These preschool Christmas activities will help to keep little hands happy during the busy holiday season! I am not even going to try and compete with the super-creative blogs out there that have sparkly end products... 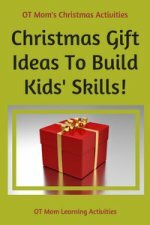 I just wanted share some ideas that you can incorporate into your preschooler's day with the aim of building skills while having Christmas- themed fun! Some of my suggestions have very small objects in them, so please do be aware of choking hazards with your little one(s). Matching and sorting activities can help your child develop visual discrimination and matching skills. The ability to sort according to shape and colour can also help to lay the foundation for spatial perception and math skills. 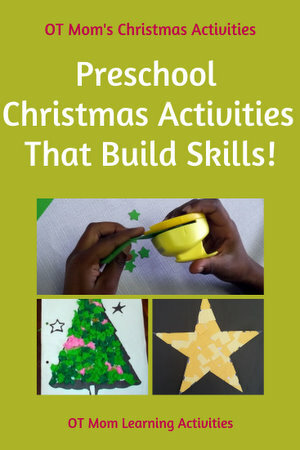 Here are some ideas that you can use with preschool kids during the Christmas holidays. Sort and match buttons - this is particularly helpful if an older child will use the buttons for a craft activity. Sort and match cookie cutters - this is a good preschool Christmas activity for toddlers to do while you are busy in the kitchen! Have your child match colours, or match shapes and themes! The OT Toolbox has a really sweet Jingle Bells sorting activity - your little kids will love it! As with all activities involving small objects - take care that your child does not choke on any! 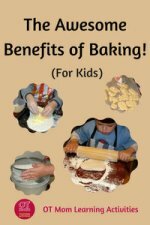 Children usually love making something that will be useful - and friends and family members usually appreciate the handmade gesture. Christmas gift bags and gift tags are inexpensive and easy for kids to make. With a bit of prep and planning, you can do this with a small group of kids as well. These kid-made gift tags will help your child practice basic scissor cutting to snip the tags to size. Using the hole punch and craft punch is also good to help strengthen those little hand muscles! 1) Cut your paper into strips along the length of the paper. I used a ruler's width, which is enough for novice cutters to snip once or twice to get across the width. If your child is confident enough to cut on the line, you can make the lines and have your child cut the strips. 2) Have your child snip across the width of the paper. I marked the strips into thirds, so we got 3 tags out of each strip. Hint: make your life easier by premarking the snipping lines before you cut the long strips! 3) Have your child use a hole punch to punch a hole on each tag. You can make it easier by marking where the hole should go. Marking the spots where your child should punch will help your child use eye-hand coordination to place the punch over the hole. 4) Have your child use a craft punch to punch out a shape on the opposite end of the tag. Push string or twine through the small hole and your tag is done! Use the shapes that have been punched out as table confetti, or use them to decorate cards and gift bags (see the section below) - have fun! Simple gift bags that preschool kids can make are always a hit with recipients. I often use lunch sacks as they are cheaper and more readily conform to the size of the gift as a substitute for gift wrap. However, you can also purchase kraft gift bags with handles that can be decorated in the same way. Check out my list of supplies to see what is available. Got lots of punched out shapes from making the gift tags above? Use them to decorate the gift bags as shown below! 1) Have your child use a glue stick to place dots of glue all over the bag where the shapes should go. Marking the spots where you want the child to place the shapes will help work on eye-hand coordination. However, it is also good to let your child be creative, so you can also give your child free rein on some bags! 2) Have your child place the shapes on the dots of glue. These should easily be visible on brown paper lunch sacks. It is a good idea to make all the glue spots first, and then place all the shapes in one go. 1) Have your child peel off stickers one at a time and place them on the gift bag. Peeling stickers off a small sheet can work on bilateral coordination (one hand holds the sheet while the other peels), as well as fine motor skills. I placed these gift bags on a vertical surface to help strengthen the upper body and encourage wrist extension. You can ask your child to place stickers in a certain pattern to help with sequencing skills. You can also make small pencil marks where you want the stickers to go, to help your child with eye-hand coordination skills. However, do also encourage your child to be creative and place the stickers in whichever pattern they like! Preschool kids need lots of opportunity to strengthen their hand and finger muscles. So, instead of coloring with crayons, cut lots of small pieces of crepe or tissue paper for your child and have them crumple the paper with their tripod fingers to make little balls. Then use the balls to decorate a Christmas picture instead of coloring. 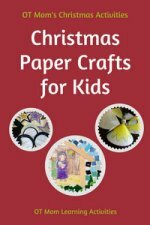 For more info, read my page on how to make the most of this activity to exercise your child's finger muscles (as well as more detailed instructions on how to cut rolls of crepe/tissue paper to a good size). Tearing and snipping strips of paper can help strengthen little fingers to get them ready for writing. This may have more fine motor benefits for your preschooler than coloring, especially if your child's fine motor skills are a little weak. Cut strips of construction paper or scrap paper for your child ahead of time. If you have an older child who needs scissor practice, then draw the lines and have him/her cut the strips for you. Show your child how to grasp the strip so the thumbs are meeting at the top as shown alongside. Then show your child how to tear by twisting one thumb towards the body. Once the technique is mastered, you'll soon have piles of little torn papers! For snipping, show your child how to hold the scissors correctly, and then demonstrate how to snip across a strip of paper as shown. Some kids take a while to master the grasp-release motion of scissors - take a look at the tips on this page if your child needs some help with this. Then decorate a Christmas coloring page with the little squares. If your child has mastered snipping, try some Christmas scissor cutting activities to work on scissor skills with a Christmas theme. Truth in the Tinsel is a combination of simple preschool Christmas activities that focus on the nativity, and devotional guidelines for parents to help their little ones focus on the real meaning of Christmas. It has been a favorite advent resource for us and I have been recommending it to my friends for years! I have written a full review on this page of my site, so do pop over and read more if you are interested. The image is an affiliate link to an advent product I love. If you purchase through this link, I may receive a small commission. You are, however, under no obligation to purchase anything! There are some basic supplies that I like to have on hand for preschool Christmas activities. Most of them can be found in your local craft aisle or store, but for your convenience I have linked to them on Amazon. These are my affiliate links and I will earn a small commission if you purchase something through my links; however, you are under no obligation to purchase anything! Look out for my Christmas Activity e-book to be released in November 2019, that will contain templates for these preschool Christmas activities and many more! Sign up for my newsletter to be the first to hear when it comes out!